Zone chairman visits Lynchburg Lions. The Lynchburg Lions Club held its monthly meeting on Jan. 28 at the Lions Club Building in Lynchburg. The guest speaker was Zone Chairman Jim Georges, a member of the Wilmington Lions Club who serves Zone Seven as its leader. Georges discussed a variety of issues facing Lions as well as future events being planned. He asked the Lynchburg club to host the next Zone Seven meeting on March 5. Tentative plans are to have it at the Lynchburg Area Fire House Community Room on the edge of Lynchburg. Following the program the club discussed items of business including a summary of the annual candy sale and the distribution of funds for community projects. The next regular meeting will at 6:30 p.m. Feb. 11. 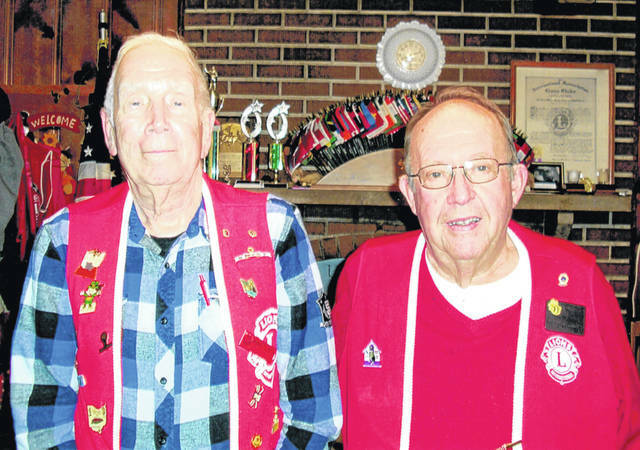 Pictured, from left, are Lynchburg Lions President Bob Roth and Georges.